Sen. Kirsten Gillibrand (D., N.Y.) on Monday joined other possible 2020 Democratic presidential contenders in backing Sen. Bernie Sanders' (I., Vt.) "Medicare for All" bill. 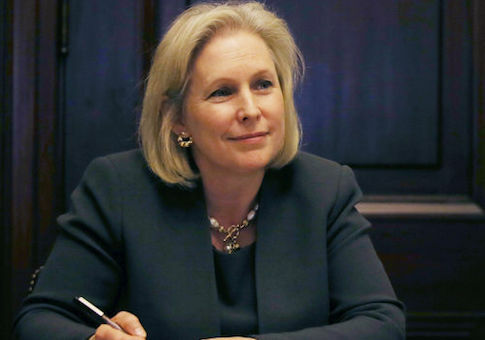 Gillibrand plans on co-sponsoring Sanders's bill, the New York Daily News reports. It is expected to go to the floor on Wednesday. The junior Senator from New York is considered one among a number of possible contenders for the 2020 democratic nomination for president. She, along with a number of other names on that list, are already spending substantially on online advertisements. Gillibrand's joining up with Sanders's bill makes her at least the fourth notable presidential contender to sign on. Sen. Kamala Harris (D., Calif.) announced her support at the end of August; Sen. Elizabeth Warren (D., Mass. ), last Thursday. Sen. Cory Booker (D., N.J.), yet another hopeful, announced his support earlier in the day on Monday. Sanders's plan would expand the federal Medicare program, currently covering only those over 65, to the entire country, which would in turn effectively implement single-payer healthcare in the United States. Sanders's website projects that it will cost $1.38 million to implement, to be paid for through a combination of a reduction in tax deductions and increased taxes on the wealthy. This entry was posted in Politics and tagged 2020 Election, Bernie Sanders, Health Care, Kirsten Gillibrand, Medicare. Bookmark the permalink.